Geotag your photos with Google Earth to create online maps. If you want to establish your website or blog as an interesting local map resource, or just market yourself with a map of the homes you've listed or sold, using geotagged photos and an embeddable map is the way to go. I do so much of this for my resort community site that I've moved to a camera with built-in GPS, but you don't need to spend that much money. You can geotag using Picasa software and inputting an address in Google Earth. Or, you can just navigate in a Google Earth map to the location where the photo was taken. You can also carry around a GPS unit if you want. Site visitors, particularly those wanting to learn more about an area before shopping for real estate, appreciate great photos and location maps. Tying the two together creates a very visually appealing presentation of homes or tourism attractions around your area. The image shows a portion of the Picasa map screen for a photo album. By grouping photos into albums by subject matter, I can create custom maps for local restaurants, shopping, art galleries and more. Mousing over an image on the left pops up the caption you assigned to the image. Clicking on any of the images pops up a larger size image pointing to the location on the map. The steps in this tutorial require that you have the latest version of Google's Picasa software, and the same for the free Google Earth viewer software on your computer. They're free and fast to install, so you may want to do that now. I've checked into at least a dozen or more mapping software and online solutions, and I haven't found a better or easier way to do it than this. And, the bonus is that I actually think the maps are more visually appealing with the image thumbnails than with little map pins or other icons. Once you've installed the free Picasa software and used it a little, you'll be familiar with the left side index of your images, and the thumbnails of those albums on the right side of the screen. 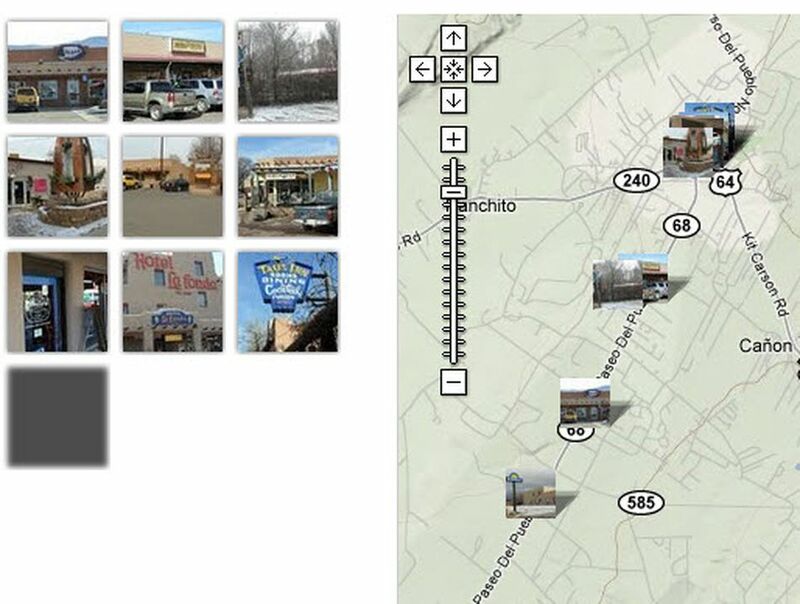 The image here shows a few of the images in an album, and the one with the arrow is our example image for geotagging and mapping in this tutorial. Once you've transferred your photos from your camera to the computer, you'll view them this way in Picasa. If you click on one to enlarge it, you'll get a chance to add a "caption" at the bottom. You'll want to do that, as this will be the popup your site visitors will see when they mouse over a thumbnail in your album. So, your first step is to transfer the images into the software and the proper folder/album to keep them together in Picasa. Then, put a nice caption under each before you do anything else. It only takes a few seconds for each photo. Now, in our next step, we'll start the process of geotagging the photo. If you're getting your photos into Picasa with geotagging already done, then you can skip this step and the next one. These steps are to take an image, find it on a Google Earth map, and have Google Earth geotag it with the latitude and longitude. As you can see in the image, we want to go to Google Earth to position our image on a world map for geotagging with the GPS coordinates. The image is made up of two portions of the screen to make it easier for you to see what to do. The main image shows how it opens up in Google Earth from Picasa. Note that our image is in the box at the bottom right, and there is a crosshair on the globe. We can just zoom in and move our map around to locate the place where we took the image, getting it under the crosshair. Or, we can to to the top left corner (shown in the box on the left) and enter an address to go right to the spot, or close to it. Then, we make sure we're under the cross mark. Here's a video from Google Earth on Geotagging. Once we've positioned our spot where the image was taken right under the crosshairs, we can click on the Geotag button to tag it with the latitude and longitude. This combination of two images shows where to click and what the final image thumbnail looks like on the map. This takes care of getting the geotagging coded with the image back in Picasa, which we'll see in the next step. We are returned to Picasa from Google Earth to find that our photo is geotagged in these two merged images. The right shows that our image now has a tiny map icon at the bottom right to tell us that it has been geotagged. If we look at our photo's properties, we'll see the latitude and longitude in the Exif data, as we see in the left portion of the image. Now you can use this image in other places as well. If you upload it to Flickr, it will go with the Exif and GPS data, so it can be mapped in the Flickr/Yahoo mapping application. As you see in the image, the left arrow points to our Picasa album name, which you'll want to make more visitor friendly, as this is just an example. This will be the title of your map, so make it appropriate and relevant, as in "Local Restaurants." The right arrow shows us the button to sync our album to the Web Album. If we want it to stay in sync, there's an option you can set up for that, and you'll always know that additions and changes are being updated in the Web Album. Once you have your album synchronized with the Web Album, you can go to the top right of the Picasa software window, and click on the "Web Albums" link. It will take you to your account, and all of your albums online. There you can easily have a slideshow created, but our goal is to get a map for our website or blog. The image shows you the bottom right of the screen when we have one of our albums open. There is a small map, and a link to "View Map." Right click on that link and copy out the link. Or, click on the link to see the map, and then copy the URL in your browser address bar. This is the link you'll use to send visitors to the map on the Picasa site. However, if you want to embed the map on your website or blog, you'll still need this link, but some embed code as well. Some template sites just ask for this link and do the embed for you. However, if you need an iframe code for embedding the map, here's what I use in WordPress. You'll use that code in the HTML window, and change the two links to the map link, and the width and height to suit your site's requirements. There you have it! You have your map on your site, and adding photos or changing captions will automatically update to the Web Album if you've set it up that way. It's easy to just add photos later and check them out on your map.